HAYS, Kan. – Josh Stark was learning about science on a day-to-day basis before he even started kindergarten. Now a junior in college, Stark is passing on to other youngsters his passion for learning all he can about science while working toward a bachelor's degree in chemistry education. Stark is one of five Fort Hays State University students who were named Noyce Summer Scholars to help with FHSU’s Science and Mathematics Education Institute (SMEI) youth camps this summer. The Noyce Summer Scholars, as well as the Noyce Teacher Leader program, is made possible because of a large grant from the National Science Foundation. In addition to being chosen for the summer scholars program, Stark also was one of eight Fort Hays State students awarded a $13,000 Noyce Teacher Leader scholarship, given to junior or senior students majoring in a science or mathematics field of study. Stark is the middle sibling of five children of Dr. Bill Stark, FHSU professor of biological sciences. Stark came to FHSU in 1998, when Josh was only a month old, and Josh remembers a lot of teaching moments even in his early years. Stark – whose mom, Bev, has a degree in secondary education from FHSU – was firmly set on teaching at the high school level. That is, until he worked with the elementary school children this summer. Fort Hays State has been offering these camps for youngsters entering second through eighth grade for more than a decade with the goal of sparking an interest in the fields of science and math. Several of the camps include sets of siblings, including the “Building with Math” camp where students learned about George Washington Ferris Jr. Ferris created the original Ferris Wheel for the 1893 Chicago World’s Columbian Exposition. Hays residents Agoni Smolarkiewicz, 10, and his younger brother, 7-year-old Kiros, tried an SMEI camp for the first time this summer, attending the “Building with Math” section. Ann Noble, financial administrator for SMEI, said her granddaughter looks forward to coming to the camp from Olathe each summer. This year, 8-year-old Laney Velleca brought along her younger brother, 7-year-old Cooper, to the "Building with Math" camp. On Day 1 of the "Building with Math" camp, FHSU’s Kate Westerhaus read the students a story on Ferris’ life. They then split up into small groups and built small Ferris wheels of their own. “This is so awesome; I finally get to teach,” said Westerhaus, a junior biology major from Junction City. Westerhaus is one of the Noyce Teacher Leader scholarship winners for the 2018-19 school year along with Stark. And like Stark, she has family in education. Her dad, Matt, is athletic director at Junction City High School, and her mom, Gretchen, is a second-grade teacher. Westerhaus is majoring in biology and was going to go the medical route because “biology has always been my passion.” However, she changed her major to education early in her college career and hasn’t looked back. “I like doing anything with kids, and I fell in love with education,” she said. Westerhaus in particular liked the idea of reading to the children first to give them some history of the project they were about to tackle. It’s a win-win situation for all involved, Noble said. Other subjects during the "Building with Math" camp week included building suspension bridges, geometry in the night sky, and designing and building a playground. Other camps this year ranged from building robots with Legos and programming those robots, to making DNA models to learning about crime scene investigation, and experimenting with engineering and nanotechnology. The need for science and math teachers is at an all-time high in a lot of districts in Kansas. The Noyce Summer Scholars program is open to any freshman or sophomore in the Peter Werth College of Science, Technology and Mathematics “to give them the opportunity to see if they might want to be a teacher,” Noble said. “We have had some of our students change their majors to teaching after the summer program,” she added. Other Noyce summer scholars this year were Jaxon Crawford, a physical education major from Kit Carson, Colo.; Ethan Shippy, biology education, Hays; and Lauren Zerr, math education, Larned. Noble meets with the Noyce scholars every week during the five-week SMEI summer program. 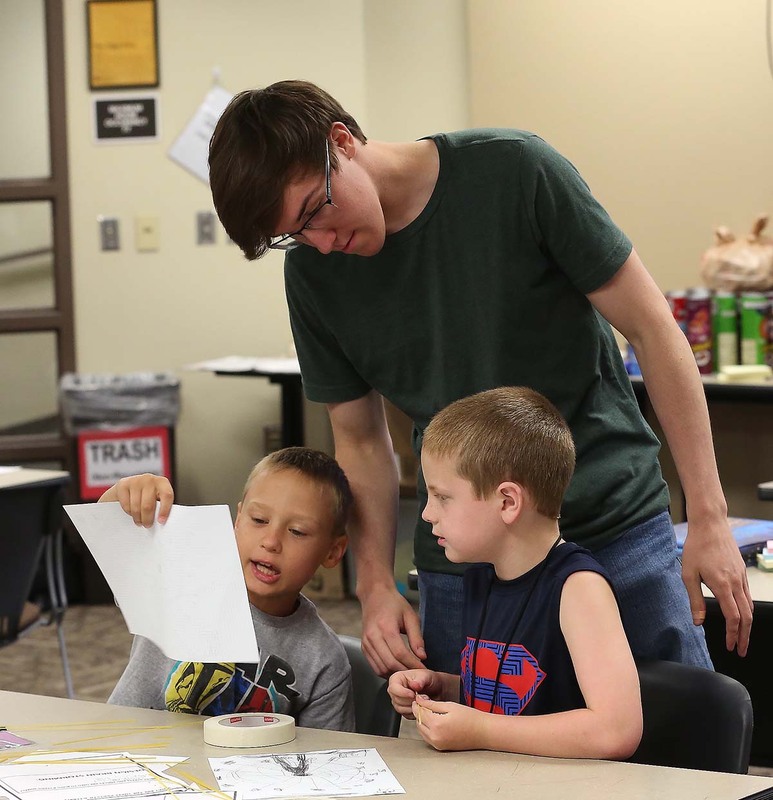 Cutline: Fort Hays State University junior Josh Stark gains valuable experience while helping teach students at a summer camp for the Science and Mathematics Education Institute at FHSU.